Banff and Buchan MSP Stewart Stevenson has highlighted the importance of International Day for the Preservation of the Ozone Layer, which takes place on Sunday 16th September. “There is an urgent need to preserve the ozone layer, which filters sunlight and prevents the adverse effects of ultraviolet radiation reaching the Earth's surface, thereby preserving life on the planet. “The awareness day was designated by the United Nations to commemorate a very important day in world history. In 1987, 24 countries met in Montreal and announced to the world that the time had come to stop destroying the ozone layer and in so doing, these countries committed themselves to rid the world of substances that threaten the ozone layer. “The ozone layer acts as a giant umbrella over the earth and protects us from exposure to the sun's ultraviolet radiation. When the ozone layer thins, high levels of UV radiation reach the earth's surface and threaten our health and our environment dramatically. Each 1% reduction of the ozone layer leads to a 2% increase in the incidence of non-melanoma skin cancer as well as to a higher incidence of cataracts and blindness. Banff & Buchan MSP Stewart Stevenson has welcomed a new scheme to protect North Sea cod stocks is to be tested using on-board independent observers. Under the initiative, skippers will be given extra days at sea if the observers conclude that cod is less than five per cent of the total catch on the trip. The observers from an independent monitoring agency will verify catches. Funded by the Scottish Government and jointly developed with the industry, the pilot scheme aims to test how effective such incentives are in conserving cod stocks. "The new Scottish government from the beginning pledged a fresh start for Scotland's fisheries. That means looking at new ideas to assist the recovery of North Sea cod stocks. "This scheme will reward Scottish skippers who are able to use their expertise to avoid cod. It is essential to harness the skill and knowledge of fishermen in order to allow other forms of fishing with minimal by-catches of cod. "The observer pilot has been worked up with the industry over the past two months. It builds on the launch last week of real-time area closures scheme also jointly developed with the industry, whereby fishermen can temporarily avoid fishing in areas with high concentrations of small cod. "The Scottish government is fully committed to ensuring healthy stocks of cod, as is everyone in the Scottish fishing industry, and in identifying sensible solutions which achieve that. "I believe the pilot will provide us with valuable information which will help us set about building a better plan for recovering cod stocks This is certainly good news for the fishing industry in Banff & Buchan." Banff & Buchan MSP Stewart Stevenson has warmly welcomed the announcement by Cabinet Secretary for Rural Affairs Richard Lochhead that he has appointed an independent group to review the appeals system for farm subsidies. Former NFU Scotland President John Kinnaird will head the review team. The announcement is a direct result of a commitment given by local MP Alex Salmond at a meeting with local farmers at last year’s New Deer Show that if the SNP won the 2007 election he would reform the appeals system which had been a cause of great concern among the farming community. “…we will introduce a truly independent appeals panel in response to the existing system’s shortcomings. SEERAD officials should not sit in judgement on decisions made by colleagues”. “I am delighted by this announcement and particularly pleased that John Kinnaird, with his depth of knowledge of the system and its shortcomings, has agreed to head-up the review. “This is yet another example of the fresh approach of the new SNP Government and one which I am sure will be welcomed by North-east farmers. Banff and Buchan MSP Stewart Stevenson has shown his support for the Citizens Advice service's annual Advice Week, taking place from 10th – 16th September. “Advice Week is an annual Citizens Advice service-wide event where events and activities are held all around the UK to promote bureaux as vital local charities, to raise much needed funds and to recruit the 5,000 new volunteers we need every year. The first one opened for business in September 1939 as World War II began, staffed entirely by volunteers and with financial support from local councils and we must remember that CAB’s are charities. “Every Citizens Advice Bureaux is an independent registered charity and without the contribution of over 20,000 trained volunteers and financial support from trusts, lottery funds, companies and individuals, they could not continue to provide their vital service in local communities – helping people to solve problems before they become crises. “The Citizens Advice service is one of the UK's largest voluntary organisations as well as one of the best known in the UK - 95% of people have heard of the organisation and nearly half have used a CAB at some stage in their life. Banff and Buchan MSP Stewart Stevenson has thrown his support behind the planned Streetfootball which comes to Banff later this month with weekly sessions organised for Fridays. “This is an excellent initiative in order to deal with the issue of youth disorder and I commend the local Brighter Horizons group, who is steering the scheme for such a creative method for distracting young people. Banff & Buchan MSP Stewart Stevenson has today (Friday) visited Fraserburgh brewery, Brew Dog. Mr. Stevenson was invited to visit the recently opened brewery by owners/directors Martin Dickie and James Watt to view the facilities and discuss various issues of interest to the new business. Brew Dog is an independent brewing company established by Mr. Dickie (24) and Mr. Watt (25) in April 2007. The company produces natural beers with no additives or preservatives and were runners up in the recent Shell Scotland Livewire Awards for Young Entrepreneurs. “I was delighted to get the opportunity to visit this excellent local business. It is fantastic to see an innovative new business with such potential for success setting up in our local town of Fraserburgh. As local MSP I have always strongly supported small and medium size businesses in Banff & Buchan such as Brew Dog for the benefit of the local economy. “I was highly impressed by the brewery’s facilities and their top quality produce. Indeed as I was not driving on this occasion I had the pleasure of sampling the freshly brewed beers which are made from only natural ingredients and can attest to their superior standard. Banff & Buchan MSP Stewart Stevenson has welcomed the Government’s decision to tackle Scotland’s excessive drinking culture by curbing cut price alcohol deals in supermarkets and shops. The Government has outlined proposals to ban any promotion that provides alcohol free or at a reduced price on the purchase of one or more of the product or another product. It is hoped that the new regulations will be created in 2008 for implementation in early 2009. “I welcome the Government’s moves to bring Scotland’s binge drinking culture to an end. In towns such as Peterhead and Fraserburgh, as with other communities throughout Scotland, it is far too often the case that people are drinking purely as a means to get drunk. “This inevitably leads to a high level of antisocial behaviour in the streets where we live and large numbers of people dying in our hospitals of alcoholic liver disease. The facts speak for themselves - over 60 per cent of prisoners admit they were drunk when they offended, and six people die every day from an alcohol related illness. “This Government does not want to curtail people’s right to have a good time and enjoy alcohol in a responsible manner, but the proposed legislation will take the right step towards making people adopt a conscientious attitude to drinking. It will naturally take time for cultural attitudes to change in the long term, but I am confident these measures will see the beginning of healthier and safer towns in Banff & Buchan and across Scotland. “There is a role in this cultural shift for the NHS, the police, the alcohol industry, and for our schools. We need to communicate with the public about taking responsibility and drinking sensibly. This Government’s proposals signal our intent to step up the pace of action on antisocial drinking." 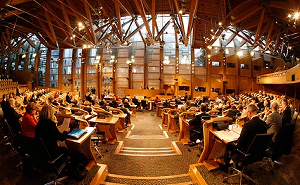 The Abolition of Bridge Tolls (Scotland) Bill has been introduced to Parliament. The legislation will enable the Scottish Government to abolish tolls on the Forth and Tay road bridge. "The proposal of a bill has received support in parliament, and more importantly, from the general public. We hope to remove tolls at the earliest opportunity, subject to due Parliamentary process." The primary objective of this Bill is the removal of the remaining tolls from the Forth and Tay Road Bridges as soon as practicable.